Charles Jackson was born in 1946 in Charleston, West Virginia. He entered the U.S. Air Force Academy in June 1965, and was commissioned a 2d Lt in the U.S. Air Force on June 4, 1969. 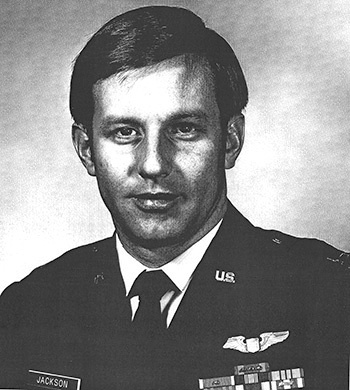 Lt Jackson next attended Undergraduate Pilot Training at Moody AFB, Georgia, from August 1969 to September 1970, and then switched to Undergraduate Navigator Training, earning his navigator wings at Mather AFB, California, in July 1971. 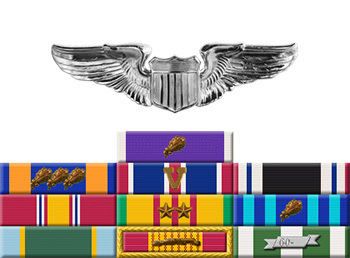 He then attended Weapon Systems Officer (WSO) training and F-4 Phantom II Combat Crew Training, before serving as an F-4 WSO with the 433rd Tactical Fighter Squadron at Ubon Royal Thai AFB, Thailand, from May 1972 until he was forced to eject over North Vietnam and was taken as a Prisoner of War on June 24, 1972. After spending 234 days in captivity, Capt Jackson was released during Operation Homecoming on February 12, 1973. He was briefly hospitalized to recover from his injuries at Sheppard AFB, Texas, and then entered Undergraduate Pilot Training at Williams AFB, Arizona, in November 1973, earning his pilot wings in November 1974. After serving in West Germany, the Bahamas, Spain, and Portugal, Capt Jackson left active duty at Chanute AFB, Illinois, on September 6, 1979. Captain Charles A. Jackson distinguished himself by meritorious achievement while participating in aerial flight as an F-4 Weapon Systems Officer in Southeast Asia on 24 June 1972. On that date, Captain Jackson was a member of a strike force attacking a large hostile force's steel-producting complex. Despite the threat of hostile aircraft and heavy antiaircraft fire, Captain Jackson, with complete disregard for his own personal safety, directed his aircraft to the target and delivered his ordnance, resulting in the destruction of this very important complex. The professional skill and airmanship displayed by Captain Jackson reflect great credit upon himself and the United States Air Force.